The latest edition of the Connecticut State Grange Public Relations Committee Resource Discs have been mailed to all of the Community Granges. This disc includes all of the tools and resources Granges will need to be able to promote their Granges both internally and externally. 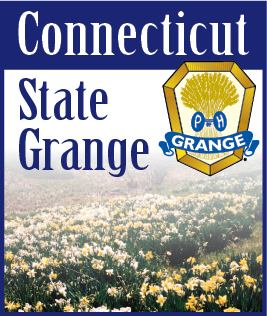 The disc includes official Grange logos (with the proper circle-R registered trademark symbol), Grange inspired clip art, backgrounds and textures, as well as PDF Files of forms, newsletters, posters, flyers, worksheets, brochures and more from the various committees and offices of the CT State Grange. We encourage all Granges to use this disc and its contents. The disc is compatible with both PC and Mac computers. If your Grange would like additional copies of this disc, please send an e-mail note with your Grange Name and mailing address to publicrelations@ctstategrange.org. With postage rates continually on the rise, the Connecticut State Grange is collecting e-mail addresses of our members and adding them to our e-mail list. E-mail is a quick and efficient method of communication that we utilize frequently. We currently send out periodic e-mails on upcoming Grange events, Grange news and concerns, and notifications of important information. We currently have at least one e-mail address in every Grange with the exception of one Grange. The more e-mail addresses we can add to the list, the better informed our membership will be. Please help us by collecting e-mail addresses of your members, and sending them to information@ctstategrange.org so we can add them to our contact database. The contests are easy to enter - and we hope to see a good participation from our Granges this year. Deadline is October 1st. • Historical Archiving Services - do you have old photos and Grange memorabilia you’d like to share? We can digitize these pieces and add them to the Virtual Scrapbook. All we ask is that you give us plenty of advance notice to ensure we can fulfill your needs! Contact any member of the committee, or e-mail us at information@ctstategrange.org or publicrelations@ctstategrange.org for more information.